It's safe to say that indie gaming has exploded in the lasts few years. What was once the realm of hobbyists has turned into a viable alternative to mainstream gaming. The recent success of Super Meat Boy on XBox Live Arcade and PC is proof enough. For gaming enthusiasts who prefer the "good old days", many indie games recapture the quirky spirit that was prevalent during the 8-bit and 16-bit era. As such, it is a subject that is a tight fit for HG101. There are literally hundreds of indie games out there of all kinds to be played, and while I could never cover all of them, I would like to cover some of the more interesting ones that I have played recently. Update: The systems the games can be played on has been added! But that was [Yesterday] is a short but sweet browser game and winner of the recent Jayisgames Casual Game Design Competition 9. 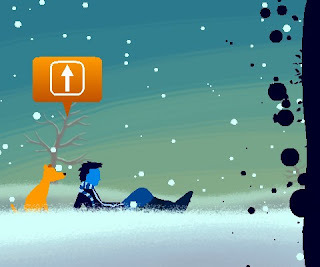 The best way to describe the game is a short, interactive adventure: the game plays out on a linear path with only 3 buttons to contend with (left, right and up). The main meat of the game is the story, told via a series of flashback events that you play through as you come to obstacles in the main level. In each story segment, you learn a new ability that allows you to move further in the main level until you reach the end. Saying any more would spoil the experience, but one thing I will mention is the ending mechanic: the ending changes depending on what time of day you play the game, with three endings to see in all. While somewhat frustrating, it's an interesting implementation of branching endings seen in many games. Take one part platform shooter, drop it into a closed arena with constantly spawning enemies, paint on a charming retro coat of paint, and you have Super Crate Box. SCB plays like your standard platform shooter: you run, jump and shoot at constantly spawning waves of enemies with a variety of weapons. What makes SCB stand out however is the scoring system. 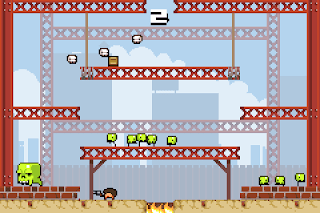 Rather than scoring by killing monsters, you instead score by collecting crates filled with weapons. Each crate you pickup changes the weapon you use, making the game more or less challenging depending on what you get. Enemies spawn from the top of the screen and make their way down. Should they fall into the pit of fire at the bottom of an arena, they will respawn as tougher, angrier versions which move faster. You start the game with only one arena and a few weapons to play around with, but as you collect crates, new weapons, characters and levels are unlocked. Weapons unlock based on the cumulative number of crates you collect, while unlocking new locales and characters requires reaching a high score in each level. There are three arenas of varying difficult, 20+ weapons, and a higher difficulty mode to find as you progress. The scoring mechanic forces players to keep moving and adapt as their arsenal changes. With the constant flow of monsters and random spawn locations for crates, it can even be advantageous to let monsters pass through the bottom of the screen and become tougher until a better weapon appears. SCB is a challenging game, so expect to die early and often. Finding a good rhythm can take time, but once you do, there is nothing more thrilling than holding out for 5 minutes or more as you collect crate after crate. 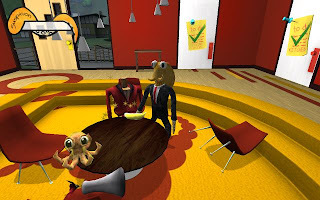 Octodad concerns itself with the exploits of an octopus pretending to be a doting husband. The titular Octodad must build a decoy so he can slip away unnoticed during his wedding anniversary. However, before he can do so, he must contend with everyday chores assigned to him by his wife and two children. 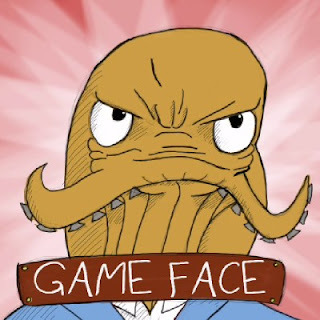 What would be a simple task for the average vertebrate proves challenging for Octodad, who lacks bones. As Octodad, you use the mouse to move around and interact with the environment. To move, you simply hold the left or right mouse button to control Octodad's left or right foot respectively, then move the mouse to reposition him. To interact with the environment, a simple tap of the spacebar causes Octodad to make use of his dominant tentacle, which can pick up and reposition any items he finds. Those familiar with the trainwreck that was Trespasser will have flashbacks: the controls for moving Octodad's arm are very similar to the failed dino shooter. There is also a suspicion meter, which acts as your health bar. Do anything suspicious and a splat of ink hits the screen as the bar fills up. However, outside of the timed challenges, suspicion never really comes into play. Your family doesn't seem to mind your awkward flailing. The only things I found that will raise your suspicion are in the beginning tutorial and the fireplace: sticking a tentacle in there is a no-no. Despite how awkward it is controlling Octodad, it never manages to be frustrating or too cheap, and watching him flop around is a joy to behold. Octodad was made as a student project for DePaul University, and while it's rough around the edges, it provides a lighthearted, enjoyable experience. More indie games will be incoming as I find the time to play them. I for one love Super Crate Box's art style. Thanks for writing about it! Please make more indie articles! But That Was Yesterday was interesting, thanks for the nod.